This past week, stimulated by the visit of Zania and Ian from Edinburgh, I have been looking through boxes of old family photos and making scans. Zania and I are “double-cousins” as our grandparents were brothers who married sisters, and that started us off talking about the older generations. Our Grandfathers were the sons of Daniel William Pearson and his wife Sarah Walker. Daniel William Pearson, the son of William Pearson and Sarah Johnson was born in 16 Nov 1855 in Whitehaven he married Sarah Jane Walker, born 10 Dec 1957, the daughter of William Walker and Agnes Duke. The death occurred on Saturday, after a long illness, of Mr D.W. Pearson, of Victoria Road, Whitehaven. Mr Pearson, who was well-known in the town and district, filled the position of sanitary and m,arkets inspector for 27 years, having been appointed in 1897, three years after the incorporation of the borough. He retired about four years ago, owing to failing health. Previous to his appointment as a council official, he carried on business in Duke Street, Whitehaven, as a butcher. Mr Pearson, who was 73 years of age, belonged to an old and respected Whitehaven family. He leaves a widow and grown-up family of six sons and one daughter. He left school early, and was a butcher, and was appointed Sanitary Inspector for Whitehaven, a post he held for the rest of his working life. Our grandmothers were the daughters of Thomas Ellwood and Mary Carr, daughter of Ralph Carr and Isabella Little, she was born 16 November 1847 in Whitehaven. The Ellwood family moved to County Durham in about 1844 to work on the coal mines, and four of their children were born there. They returned to Cumberland about 1852, where Thomas worked with his father as deputy overman at Croft Pit, before going to sea in the 1860s. Three of Thomas’s uncles also went to Durham, but they and their families did not return to Whitehaven. His uncle Thomas Saxon Ellwood went to America, while William and Isaac stayed in Durham. The death was announced on Saturday of Mr Thomas Ellwood of Duke Street, at the age of 69 years. Mr Ellwood was a native of Whitehaven. He was the eldest son of the late Mr John Ellwood, Low Road, an overman and master wasteman at Croft Pit. The father used to be greatly interested in astronomy and other scientific pursuits, and the son inherited some of this intellectual bent and continued a long connection with the Whitehaven Scientific Association. Mr Thomas Ellwood began life by seafaring, in the Maiden Queen under Capt. Smith, of Parton. But he soon left this, and began again in the Whitehaven Colliery. After some years he obtained a manager’s certificate, and then went to a colliery at Dearham as manager, and subsequently to collieries at Wrexham and Workington. He then returned to Whitehaven, and retiring from mining, took over a pawnbroking business in Senhouse Street that had previously been carried on by Mrs Carr, he wife’ mother. This he continued to carry on until the time of his death. He was twice married. His first wife was a daughter of the late Captain Carr. The Carrs were then living in Senhouse Street. By the first marriage there was a large family – twelve in all, of whom two died and ten survive, who are all grown-up. His second wife was Mrs Jackson, of Duke Street, who survives him. At one time Mr Ellwood took a very great interest in party politics, and was an active and strong partisan on the Conservative side, in local as well as imperial affairs. In local affairs he used to be one of the foremost spirits in elections for the old town and harbour board; and in imperial affairs he was one of the original promoters of the Whitehaven Conservative Association. In those days Whitehaven Conservatism had no popular organisation, while Liberalism had; and a movement was taken up by twelve of them, who were at once dubbed the twelve apostles, to found an association, which resulted in the establishment of the Club in King Street. Mr Ellwood also took a great interest in Odd-fellowship. He was a member and officer of the Whitehaven lodge, and has served as Provincial Master of the Whitehaven District. Thomas Ellwood married Mary Carr, the daughter of Isabella Little and Ralph Carr (he died at sea in 1862). The Carr Family – taken 12 June 1874 (original on glass) note on the back gives ages -Left to right top: William Carr (14), Bessie Carr (17), Ralph Carr (23), Thomas Carr (12), Thomas Ellwood (30) Sitting: ? , Isabella Little Carr (63), Mary Carr Ellwood (31), Isabella Carr Ellwood (on lap), John Ellwood, Ralph Carr Ellwood. My grandmother Martha (Mattie) was particularly close to her younger sister Margaret (Maggie) and as she left Whitehaven for South Africa in 1913 to marry William Walker Pearson, kept up a correspondence with her for the whole of her life. Unfortunately I do not have portraits of all of her brothers and sisters but will go on searching through the old boxes in case I can find any of John and Mary when they were young and of Thomas and Robert. He was a well-known runner in his youth. He lived with Ernest and Maggie Pearson until he died. He had a superb collection of semi-precious stones which he collected on Fleswick Beach near St Bee’s Head. As I was growing up I knew of her as “Aunty Belle” she was a matron in a hospital, and lived in an old terraced house in New Road Whitehaven near the cemetery. My gran used to tell us tales of Whitehaven and the family and my Mum and Aunty Molly used to say to her that she really should go on a trip and see them all, but she always had a reason why she could not go. One year Aunty Molly had jaundice and Gran went and helped with the children while she was ill. We had a wonderful old family doctor, the old fashioned kind, and Mum and Aunty Molly told him that they thought that Gran should go and see her sisters. He then told her that she had been working so hard helping with the family that he thought she needed a trip and that the best thing would be for her to go overseas. Lo and behold, she and an old friend were gone within 6 months and went again a couple of years later. It was very good as she was able to see Aunty Belle before she died. Mary Ellwood, born 20 May 1875 in Whitehaven, . Mary died in Belfast on 9 July 1964. 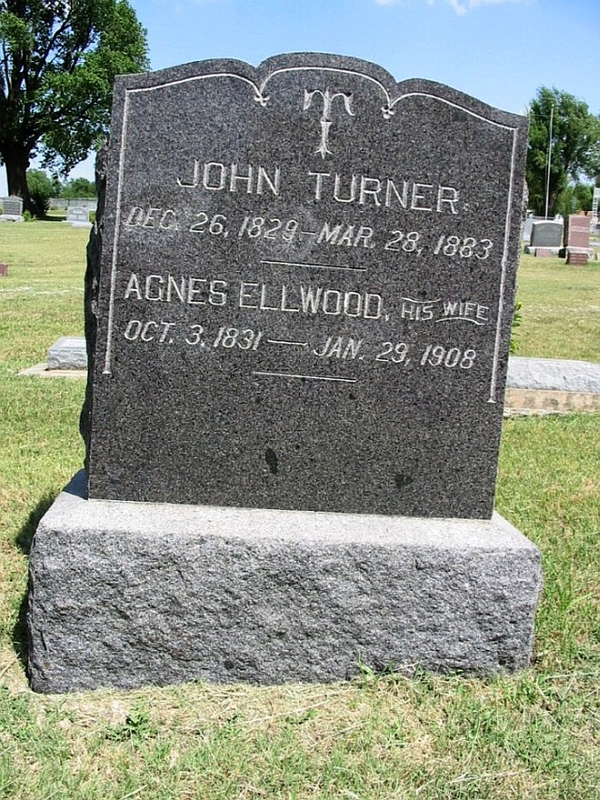 She married Jonathan Addison in 1896 and they had 7 children. The eldest, Mary was a great friend of my gran, in fact she was only 13 years younger than her. Mary Addison (b 1898) married John Hayes (no relation to Steve) and they visited us twice in South Africa. They had no children of their own and travelled a good deal, they were really great fun to be with. John had the most remarkable memory for places. We would be travelling down a road and he would say, “sure and around that corner is ……” and he was always right. He had only been there once before! she married Isaac Nicholson (1874) in Whitehaven on 6th August 1900.
they had two children. Doris Nicholson and John Ellwood Nicholson. She married a second time to a man called Tom Caddy. Thomas Carr Ellwood was born on 17 Sep 1881 in Whitehaven. He married Margaret McMeehan, who was born 25 Dec 1879 in Northern Ireland, in 1902. They had 6 children (two daughters and four sons). We do not have a lot on this branch of the family. We probably have not worked on it for nearly 40 years so we need to go back and do some more searching! was born 17 Nov 1885 in Whitehaven, she followed her fiance William Walker Pearson to South Africa where they were married in St John’s Church, Pinetown, on 3 November 1913. William Walker Pearson, the eldest son of Daniel William Pearson and Sarah Walker was born 9 Dec 1883 in Whitehaven. He was a ship broker in Whitehaven, where he managed a fleet of five or six steamers. He came to Natal in 1909 and on 16 November began working for the forwarding office of the Natal Government Railways. When the forwarding office was closed in 1917 he was transferred to the Harbour Revenue Department and ten years later he was in control of shipping intelligence – allocating berths to the ships arriving in the port of Durban. After his marriage in 1913 he and his wife lived in Pinetown, and later at St Thomas’s Road Extension, in Durban. In 1923 the family moved to 315 Main Road, Escombe. He was a member of the United Grand Lodge of Free Masons of England, having been admitted to the Third Degree at the Temperatia Lodge No 2054 at Whitehaven. “Fleswick” – 315 Main Road, Escombe c 1947 the home was named for the beach near St Bees where Martha and her sisters collected semi-precious stones as children. William and Martha had four children, William Ellwood Pearson (1915-1984), Mary “Molly” Pearson (1918-2003) and her twin Arthur, who died of diptheria, (1918-1919), and Dorothy (1923-1984). William Ellwood Pearson (Billy) – Born 8 Aug 1915 in Durban, South Africa and died in England in 1984. He married twice, first at the Magistrates Court in Durban on 18 Jun 1939 at the age of 23 to Edith Marion Woods – he is shown as a teacher and her as a music teacher. This marriage ended in divorce. On the 13 Jan1948 he married Liuiga (Louisa) Sonetti (b 1927 in Italy) in Cape Town. They lived for some time in Nigeria, and also in Italy before settling in England, where he worked for Lever Brothers. They had three children, Francis (1948), Alan (1951) and Rosemary (1952). They visited William and Martha in Durban in 1952. Billy spent some years in Guatamala and Belize prior to his final return to the UK. Molly and Sydney had 4 children, Enid, Arthur, Douglas and Margaret. Douglas Gammage b 1953 married to Margaret Gibb, they had 4 children. Kenneth, Daniel (died young), Richard and Laura. She married Keith Greene on the 23 June 1945 at St Paul’s Church, Durban. (they were the first couple ever to have their wedding photographed inside the church) Keith was born in Johannesburg on 4 July 1922. Valerie Greene b 1948 married to Stephen Hayes in 1974 they have three children, Bridget, Simon, and Jethro. Greene and Gammage families in 1978. Left to right: Top – John Machin, Douglas Gammage, Doug Foley, Arthur Gammage, Sydney Gammage, Enid Ellis holding Hugh, Keith Greene, Stephen Hayes, Ella Hayes (his mother) Front: Margaret Foley, Elaine Machin holding Gregory, Molly Gammage holding Simon Hayes, Dorothy Greene holding Bridget Hayes and Valerie Hayes. This was the last time that we were all together for a very long time. 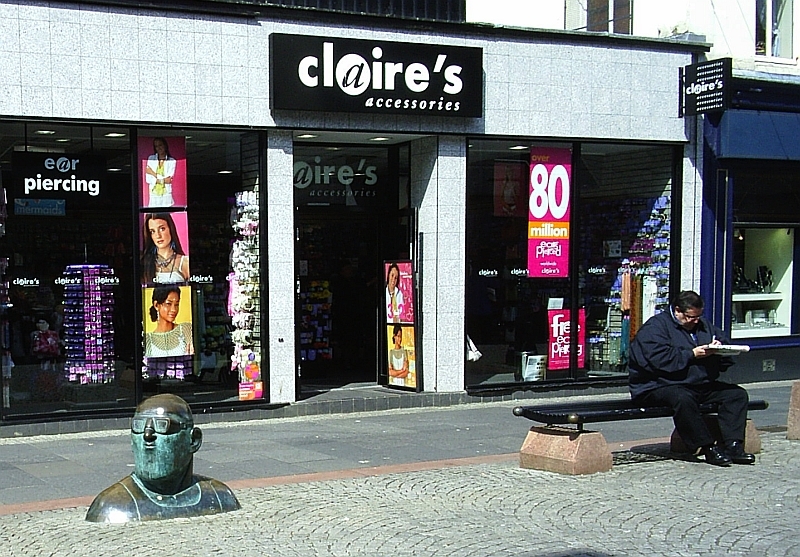 was born at 60 Victoria Rd, Workington. He was educated in Whitehaven. Served in Royal Air Force in Second World War, mainly in personnel management. After the war spent most of his working in Navy, Army & Air Force Institutes (NAAFI), in Egypt, Middle East and Singapore. Retired in 1983. He married Jean Mary Bearn (b 1921)on 9 Aug 1952, and they had three children, Joseph, Susan and Gordon. In 1996 I won a ticket to the FA Cup Final between Manchester United and Liverpool and was in London for a week. I went to Berkhamstead visit. Ralph had died about 4 months before but I met Jean and the family. We are in touch with Gordon. born 30 Oct 1923 in Whitehaven. He married Christiana Rose Nora Lees on 4 Aug 1947. We knew her as Nora and corresponded for many years. We were able to visit her in 2005, she gave us a lot of information on the family and told wonderful stories. John died on 12 March 1984 and Nora on 1 February 2017, we are so glad to have known her. John and Nora had two daughters Maxine and Zania. Zania Pearson b 1953 married to Ian McKenzie, they had three children, Twins Litza and Alexander ( Alexander died at birth) , and Andrea. We had very little contact with her side of the family. So this is just a little bit of the Pearson/Ellwood tree – mostly that which links the two families. Anyone who has anything further to add we would love to hear from you. We left Girvan after breakfast, and drove to Maybole, where the McCartneys had come from. My maternal great great grandparents were Thomas Hannan and Janet McCartney, who were married in Maybole and lived in Girvan, so we wondered if there might be some McCartney graves in Maybole cemetery, but did not see any. We looked at the old cemetery there, where there was a plaque saying that the parish church had been founded in the 11th century, and there was a ruined church across the road. It was interesting to see the different styles of inscription, though some, particularly the sandstone ones, were badly weathered. The 18th century and earlier ones had large writing, and sometimes Celtic designs on the back, while the early 19th century ones were smaller, with some parts in italic. 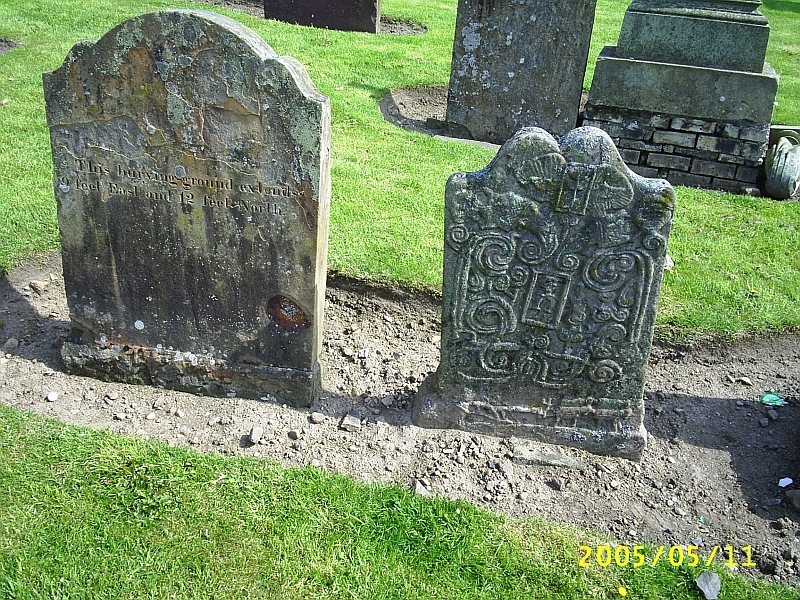 About the mid-19th century the favoured style switched to sans serif, and sometimes later inscriptions on the same tombstone were in a diffferent style. There were lots of broken bottles in the cemetery too. We by-passed Ayr, and stopped at Kilmarnock to change traveller’s cheques, and bought a couple of CD WORM discs to back up some of the pictures we had taken. 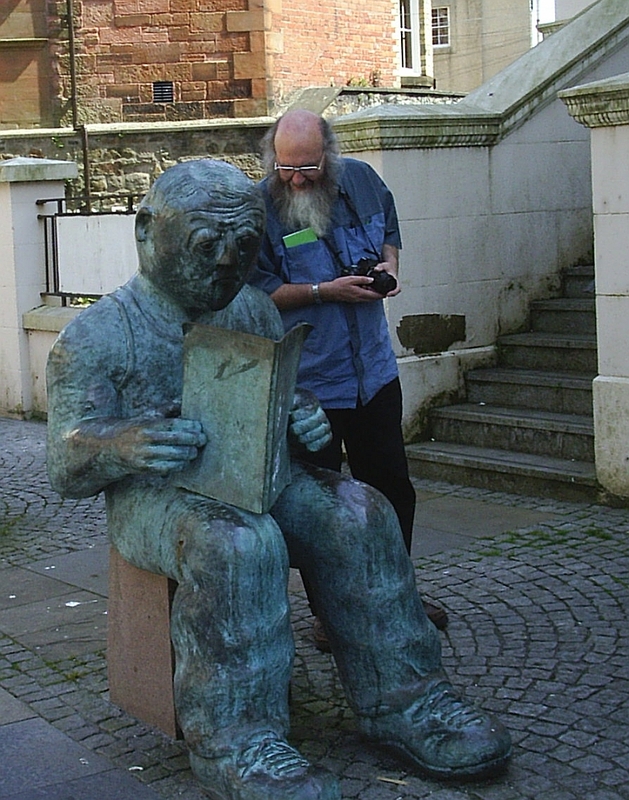 In some of the pedestrian streets there were strange statues buried in the streets, and we took photos of them. Kilmarnock was quite a pleasant town, and the biggest town we had seen in Scotland so far. From there there was a new motorway to Glasgow, which we covered quite quickly, and drove through Maryhill and Bearsden to Milngavie to see Ria Reddick. She was my mother’s cousin, and the only one of that generation of the Hannan family who was still alive, as far as we knew. She was out, however, and a woman in charge of the subsidised housing where she lived said she had gone on a bus trip, so we left a note for her with our cell phone number (see here for more on the Hannan family). 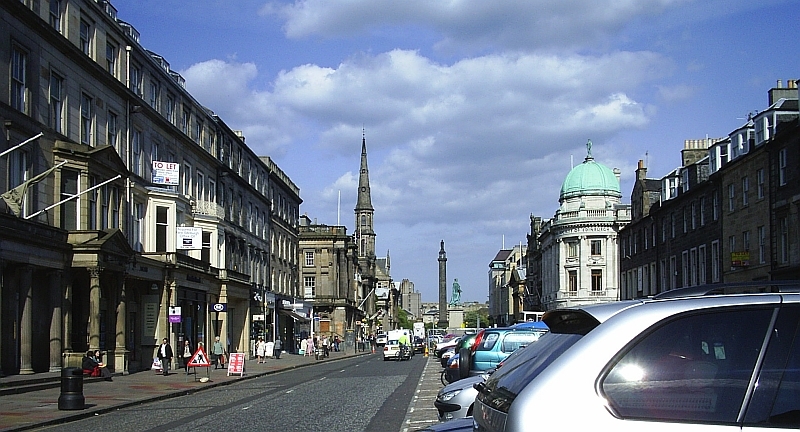 We drove on to Edinburgh through Falkirk, and went to John and Maxine Wincott’s place in Fairmilehead, but they were out, and then to Maxine’s sister Zania’s house, but they were out too, so we went for a drive around the town, though it was peak hour traffic. But we managed to catch glimpses of the castle and Holyrood House, which was at least more than I had seen on my previous visit in 1967, when I had changed trains at night at Waverley station at night. We got stuck in very heavy traffic waiting to cross the Forth Bridge, and went back to the bypass road to try to find a way out of town, and went east to Dunbar, and were about to book into a bed and breakfast place when Zania rang, and so we went back to her place for coffee. 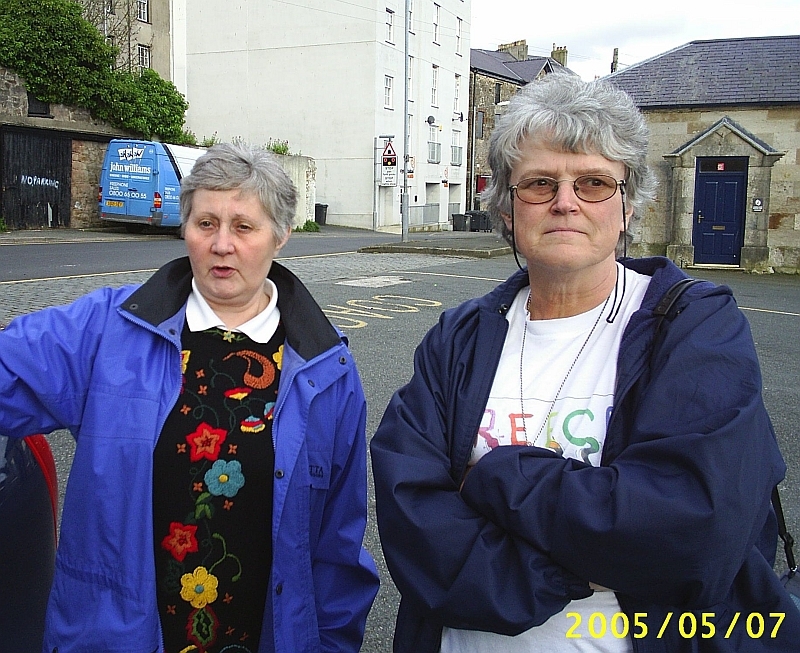 Zania McKenzie and Maxine Wincott are sisters, daughter of Nora Pearson, whom we had seen in Whitehaven two days before. They are Val’s double second cousins, being related on both the Ellwood and Pearson sides of the family, making them genetically equivalent to first cousins. We spent the night with John and Maxine Wincott, and walked up to a local restaurant for supper, and I drank a local beer recommended by John, and then some Newcastle brown ale, and had spaghetti and meatballs for supper, as they didn’t have any fasting food on the menu. Afterwards we went back to the house, and looked at some of our family photos, and some that Maxine and Zania had. Zania’s husband, Ian McKenzie, joined us. We spent the light with John and Shirley Davies at Gobowen, near Oswestry. I woke up at about 2:00 am, and caught up with writing my diary and made family history notes. Later at breakfast Shirley told us more about their lives since I had last seen them 35 years before. 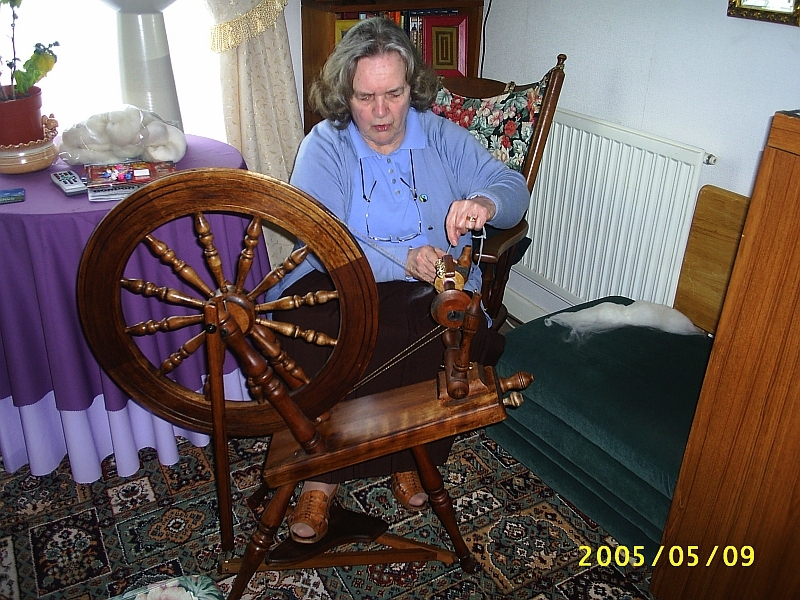 After breakfast Shirley did some spinning, and it was the first time I had ever seen a spinning wheel in action. I’d only ever seen them used as decorations before, starting with the people who bought our old house in Westville, and made it into the homes and gardens pages of one of the Natal papers, which featured a picture of a spinning wheel. everything simple, the garden a jungle, especially at 11 Queens Road Parktown. Shirley said she hated living there, because she felt boxed in, but it held good memories for me, because that was where they lived when I knew them best. We left just after lunch, at 1:30, heading north, and re-entered Wales, going in to Wrexham to cash a travellers cheque at the Nat West Bank, and then going on to the M6 motorway and driving as fast as the traffic and speed limit would allow. We stopped at one of the services places after we had passed the Liverpool-Manchester conurbation to buy sweets and a Coke and a Sunday paper, the Independent. While my Cottam ancestors had lived in Manchester and in the Lancashire area, we did not have time to go and look for the places where they had lived, and so stuck to the motorway through the urban areas. I noticed a change there from when I had lived in the UK in the 1960s. Then I had been struck by how orderly and polite British drivers had been compared to South African ones, who tended to be aggressive. Back then British motorists would flash their headlamps to say “After you,” while South African motorists would flash their headlamps to say “Get out of my way.” Now it was the other way round. I recalled a visit from Val’s second cousins a couple of years previously, John and Maxine Wincott. I took them on a tour of Tshwane, and John was amazed at the behavious of drivers at four-way stop steets and places where the road narrowed, how they filtered in, taking it in turns. On the busy motorway junctions in the Liverpool-Manchester area, however, if anyone tried to filter in from an acceleration lane there would be angry light flashings and sometimes hooting from other vehicles. I wondered if it was a change in culture brought about by Maggie Thatcher. We turned off the motorway to drive to Windermere, where I had once visited the home of a college friend, Craufurd Murray, in 1967. Then it had been cold and overcast, and the lake had looked grim and grey and cheerless. Now it looked a bit brighter. We drove round the northern end of Lake Windermere, through Ambleside, and then over the Wrynose and Hardknott passes, which were reminiscient of the mountains of Lesotho, though of course they were much lower and closer to the sea. The Wrynose Pass in the Cumbrian fells, looking back East towards Windermere. 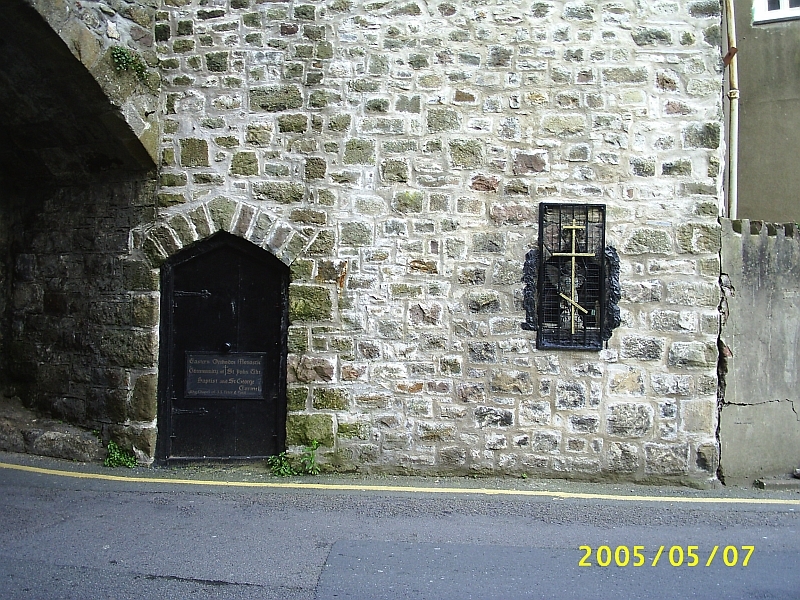 9 May 2005. The roads were narrow and winding, and we saw lots of sheep. The young lambs were black, and the older sheep brown with white faces. Seeing them reminded me of Rebecca West’s book Black lamb and grey falcon, describing travels in the Balkans in the 1930s, and indeed the Cumberland fells looked a lot like the mountains of Albania too. The Hardknott Pass was even steeper than the Wrynose Pass, but we were going downhill over the steepest bits, down into Eskdale. 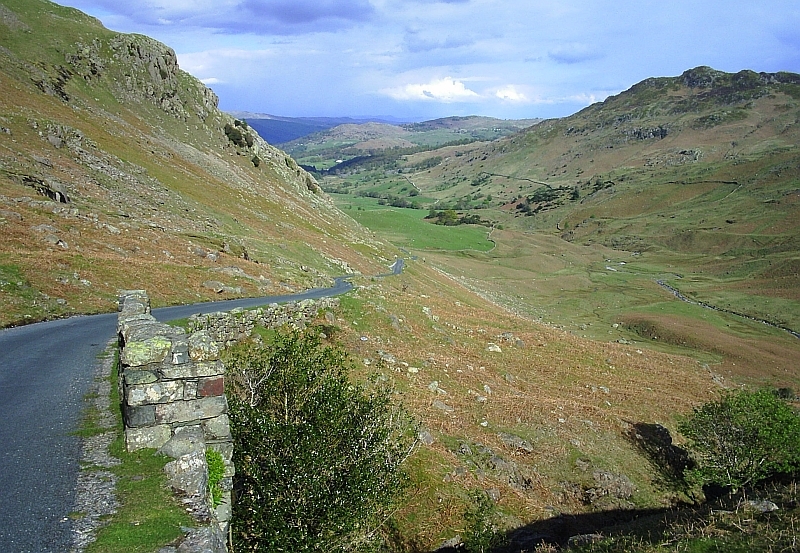 Eskdale, Cumbria, from the Hardknott Pass. 9 May 2005.
and also for a loo, but could not easily find either. family. She had been ill, and was only now able to walk around again. She had a cat which she kept a prisoner and would not allow to go outside, though she had a fairly big garden and lived in a quiet cul-de-sac. We had corresponded with her for about 30 years about the family history, but this was the first time we had actually met her face to face. We phoned one of the bed and breakfast places on our list, at Lowca, and went out to stay there, and returned to Whitehaven for supper in a Chinese restaurant, one of the few open and serving food as it was after 9:30 pm. We were the only ones there, and an excessively polite and smiley waiter persuaded me to try Chinese beer, which wasn’t bad. We had eggs foo yong which was good, and sweet and sour pork, but that was not up to our benchmark of the Phoenix restaurant in Point Road in Durban, which was the standard by which we evaluated all Chinese restaurants. We looked at books on old Whitehaven that the people in the B&B place had lent us, and there was one on Lowca Engineering, which had made steam locomotives, where Ernest Pearson (Nora’s father-in-law) had worked. He was originally an acetylene welder at Lowca Engineering Works, near Whitehaven. He served in the 1914-1918 War in the Royal Flying Corps at Halton, Bucks and at Blandford, Devon. About 1923 the Lowca Engineering Works closed down, and he went to work for his brother-in-law’s company, John Ellwood & Co, as a plumber and electrician, and remained there for the rest of his working life. We left the rather bland hotel in Caerphilly just after 8:00, and went to have a look at the castle in daylight. I was interested in Caerphilly and Whitchurch because my great great grandmother, Catherine Harris, who married James Andrew Hayes, was said to have been born in Whitchurch, and her mother Sarah was born in Caerphilly. 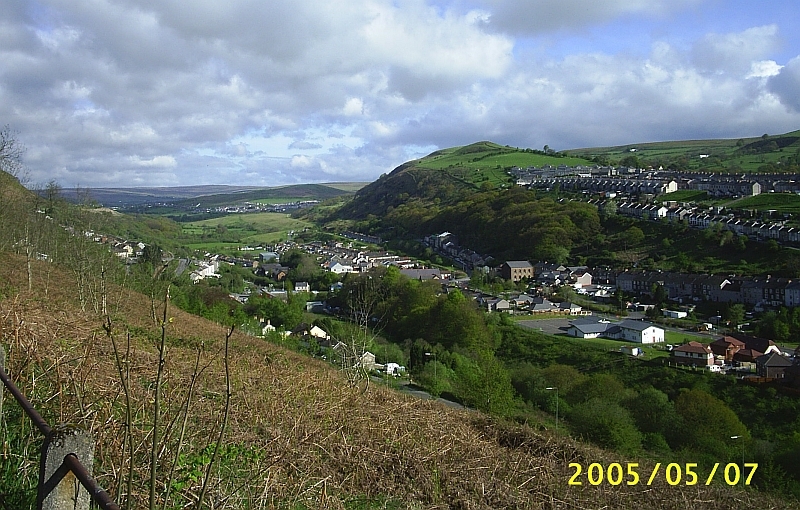 We drove north, up the Rhondda valley stopping at Brecon for breakfast at a small cafe, as the hotel breakfast was optional and rather expensive. The town was full of secondhand bookshops, and if we’d had more time and money we might have spent a couple of days there, but instead we went to W.H. Smith and got a couple of extra films and a map of North Wales. We had just left the town and gone about 10 miles when Val discovered she had left her bag behind, so we went back to the cafe and looked for it, and they hadn’t even cleared the plates away. There was a lot of traffic on the major roads, so we took the minor ones, which were winding and twisting. We stopped at the Clywedog Reservoir to take some photos. We reached Blaenau Ffestiniog just after noon. It was quite a big town, but mostly winding and twisting along the main road. When we originally planned our trip we had hoped to meet Father Deiniol, the Orthodox priest there, whom I had met in Albania a few years previously (see here for that story). But it turned out that the time we would be there, he would be away in Turkey. Even though Father Deiniol was away, we looked for the Orthodox Church, but could not see where it was, though we stopped to look and just about every building that looked vaguely church like. Most of them were abandoned and derelict, or were being used for something else. 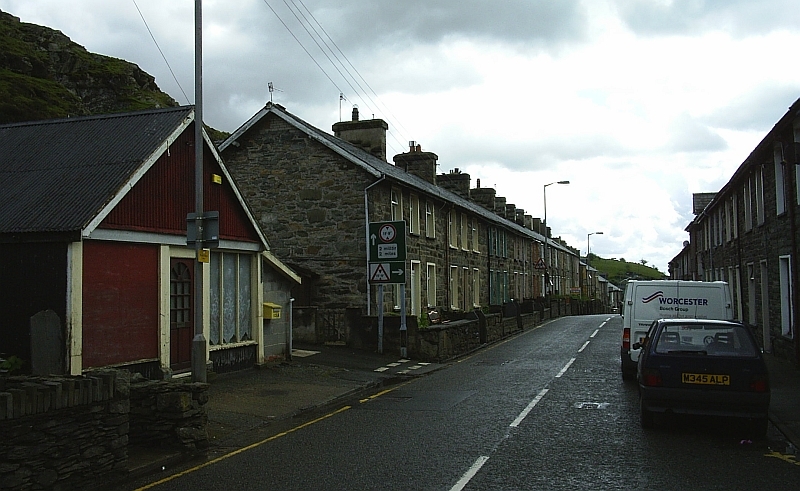 Blaenau Ffestiniog, Wales. 7 May 2005. We drove on to Betwys-y-Coed, which seemed to be full of tourists and tourist accommodation, and turned off just before Caernarfon to look for Deiniolen, where Viv and Geraint Jones lived. We missed the turn off were looking for, and could not go back as a lot of cars were following and there was no place to turn, so took the next turn off and got lost. We drove through some villages, and found ourselves on a hill above a village we thought was Deiniolen, but were not sure about, because there was no signpost saying that it was. Viv Jones phoned, and suggested that we should stay were we were and that they would come to look for us, but that was not a good idea, as they got lost too, but eventually they found us and led us to their farm Blaen Ce Uchaf, just outside Deiniolen, where we had tea with them and their daughter Alison, 24 years old, who was doing a PhD in Chemistry at Bangor University. Their farm was 70 acres, and they had cattle and sheep. 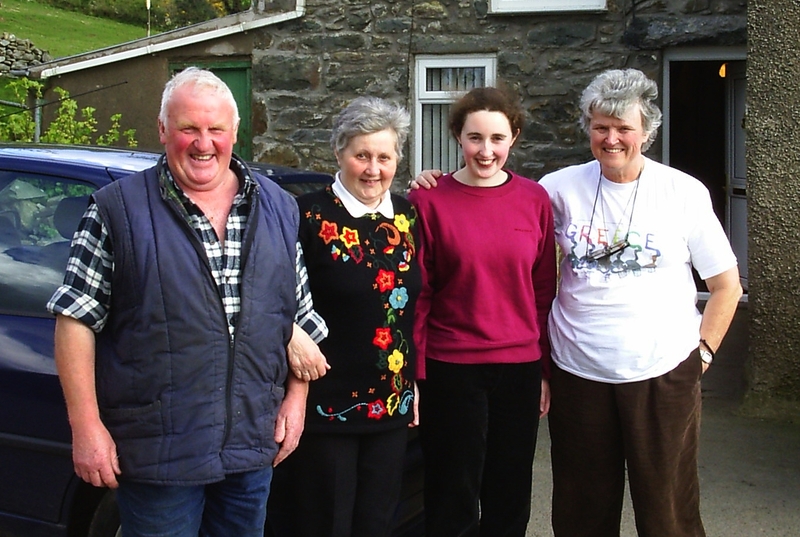 Geraint said it had been in his family for four generations, and it seemed rather sad that they had no other children who could work it for them, and to whom they could leave it. They worked it all themselves. Viv and Val were second cousins on the Ellwood side of the family, and Norah Pearson (of whom more later in this series) once wrote to us saying that Valerie, Vivienne and her own daughter Maxine were all born within a few months of each other in 1948, and she recalled making matinee jackets for the three of them. Their maternal grandmothers were Martha, Bridget and Margaret Ellwood, daughters of Thomas Ellwood and Mary Carr of Whitehaven, Cumberland. 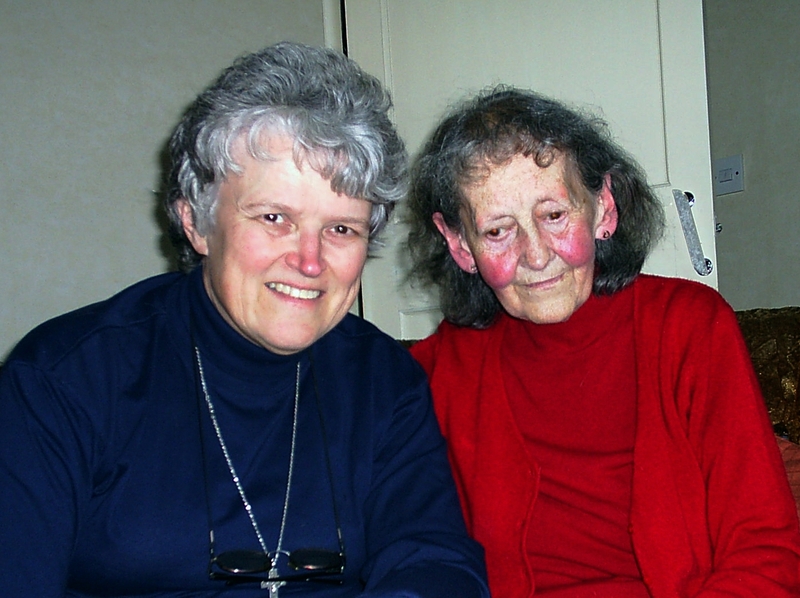 Cousins: Viv Jones and Val Hayes, Caernafon, Wales. 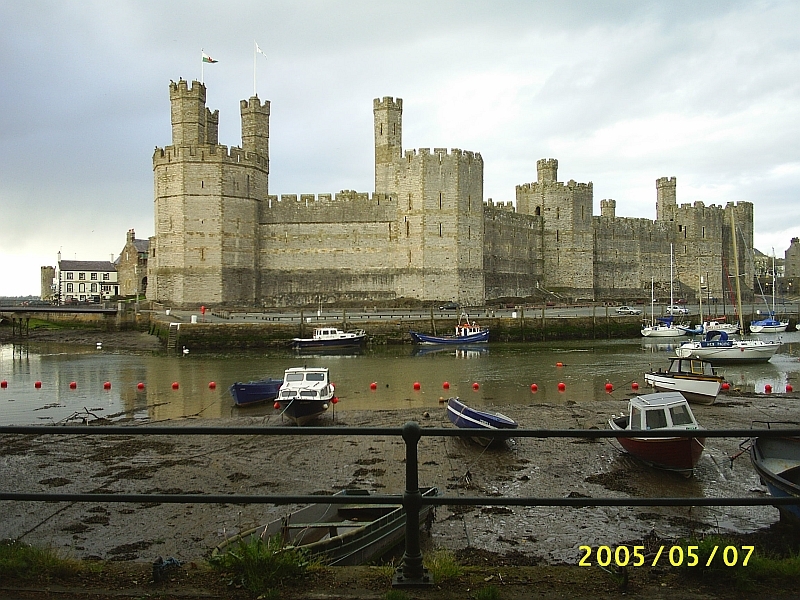 and then to Caernarfon Castle, where there was an Orthodox Church in the city wall. It had a sign saying that it was in the care of a monastic community that lived outside the town, but did not say what time there were services, or where the community was. Orthodox Church in the city wall, Caernafon, Wales. Viv left us to join the others at the hospital, and we walked round the castle, and across a pedestrian swing bridge over the river, taking photos. and as seemed usual when we reached the water, the tide was out. We drove back to the tea room, but they were just closing the dining room as we arrived, and so we drove on to a pub up the road, and had lamb curry for supper, and I had Newcastle Brown ale, my all-time favourite beer, which I had not had for many years. The second best, Lion Ale, is no longer made. When I was in England to study 40 years ago, I had often eaten at Indian restaurants in preference to English ones, because Indian food was so much better, but now the pubs are offering Indian food, though they still made rather watery curry-flavoured stew, and offered it with chips as an alternative to rice. mother’s things, and wondered if the Mary Barker was related, but we did not immediately recognise it. 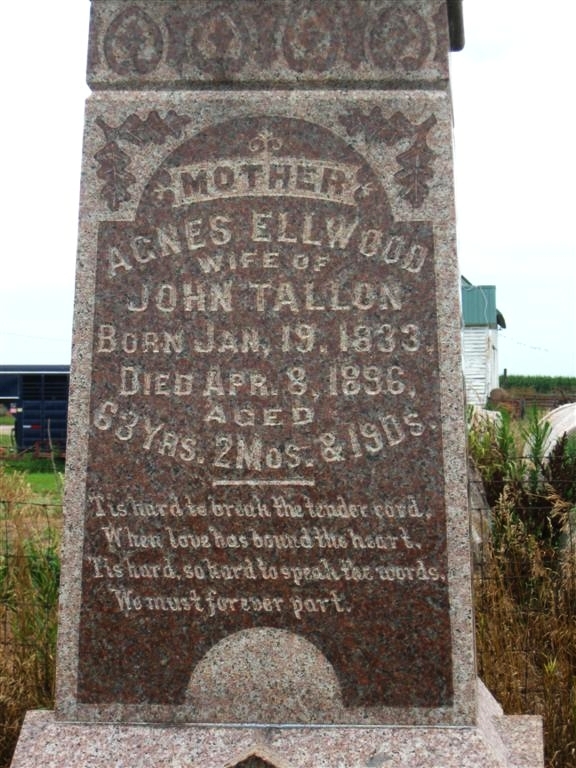 Her mother, Elsie Fee, was Val’s mother’s first cousin on the Ellwood side. 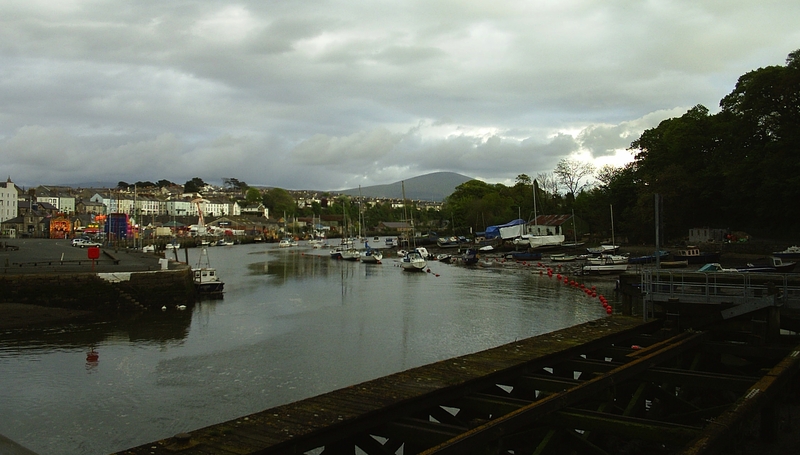 They then took us for a ride over the Menai Bridge, which was quite famous, to the island of Anglesey. 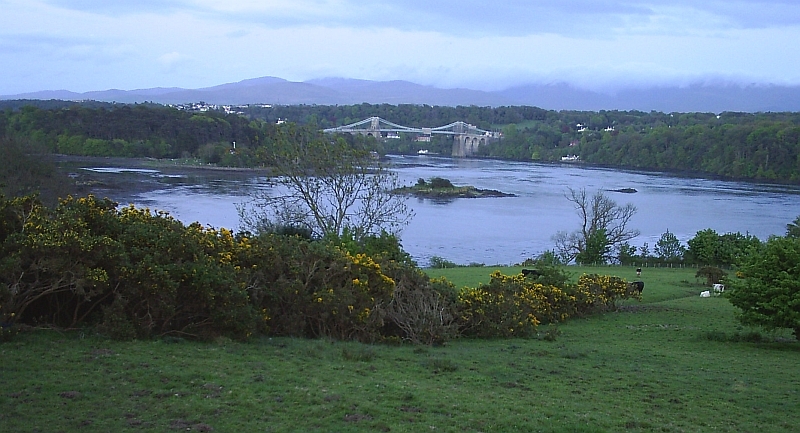 The Menai Bridge, 7 May 2005. On the Anglesey side there was also the place with the longest place name, Llanfairpwllgwyngyllgogerychwyrndrobwllllantysiliogogogoch, and Geraint took great delight in saying the name for us. 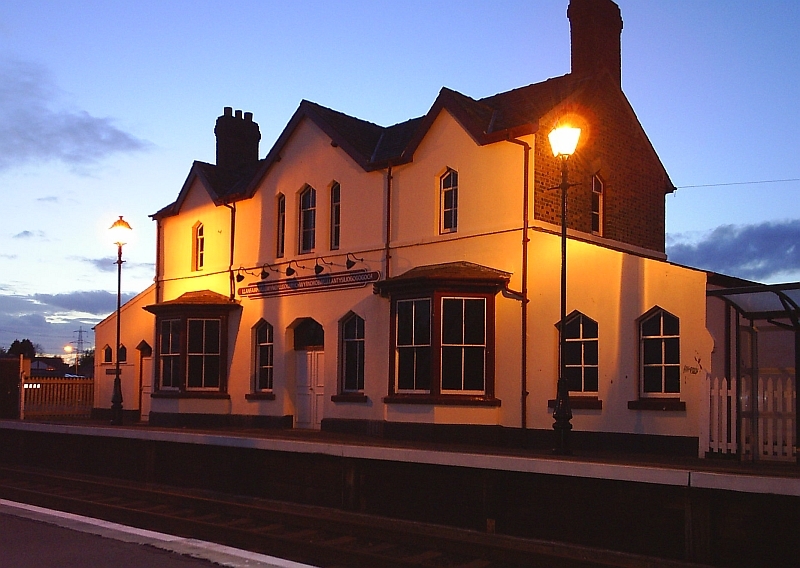 Llanfairpwllgwyngyllgogerychwyrndrobwllllantysiliogogogoch Station, Anglesey, Wales 7 May 2005. Then we went to Bangor, to see the cathedral, and Geraint and Viv dropped us back at the tea room at 10:30 pm. 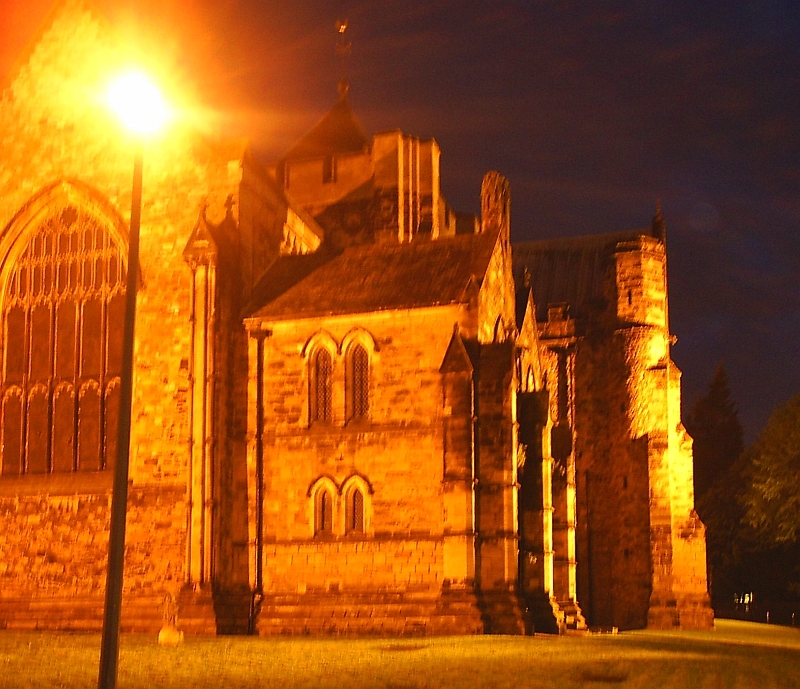 Bangor Cathedral, Wales. 7 May 2005.